This here is a tailgate/grillgate recipe for the ages. Huge shrimp stuffed with a classic RITZ cracker seafood stuffing, wrapped in bacon, doused in a new Chipotle Dr Pepper® BBQ sauce, and grilled over coals for an epic bite that will win all the parties. Hint ….Homecoming ….???? Anyone? Bueller? FOOTBALL! It’s back thank gawd. 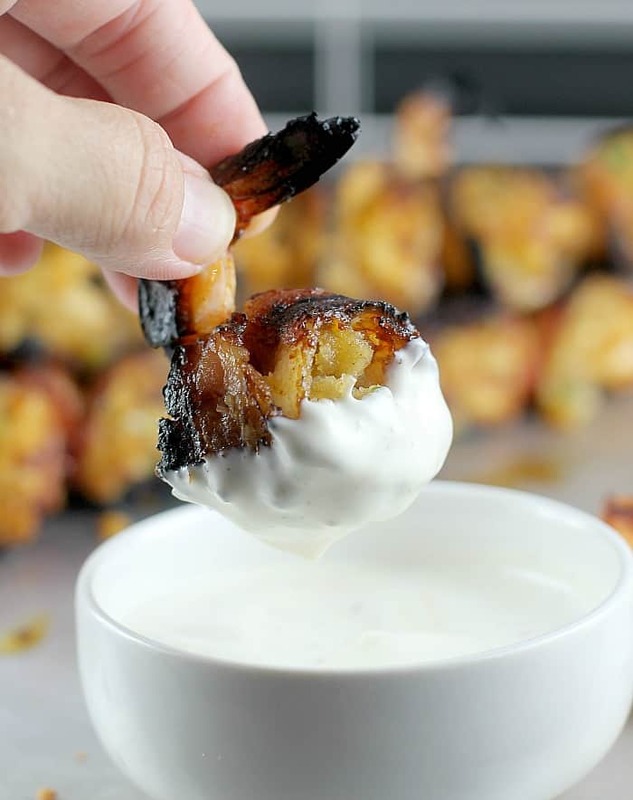 And because I am from Florida and we have big schools and big teams, it is only fitting that we come up with a ridiculously fun new recipe for tailgating with the grill and awesome game-day grub. 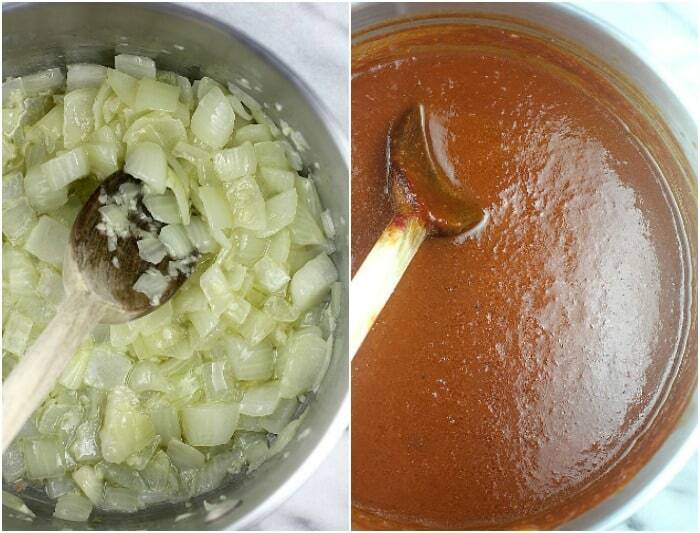 We start with some butter, onions, and garlic, then add a bunch of stuff to get our Chipotle Dr Pepper BBQ Sauce. This simple Seafood Stuffing made with RITZ crackers is a total throw-back to my childhood in Massachusetts. 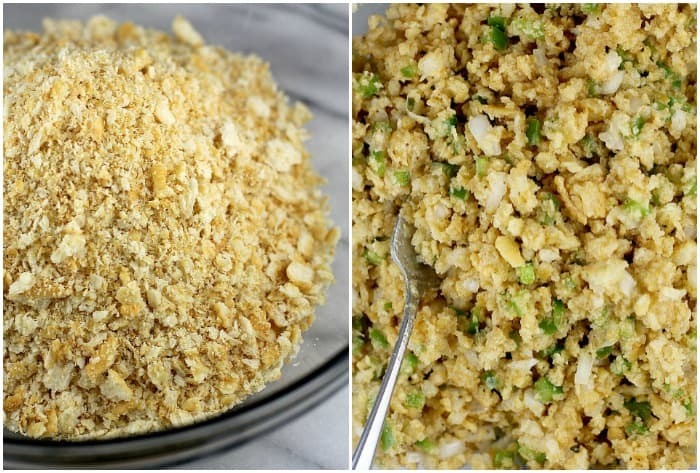 RITZ makes the best stuffing for seafood. For the shrimp, the bigger the better. Because bacon takes a bit to cook on the grill, we want our shrimp big so they don’t cook too quickly before the bacon is done. I make up new recipes all the time, but these Bacon-Wrapped BBQ Stuffed Shrimp sent me over the moon. AND as a bonus, every component can be made in advance so that come game-day, just grill them up and make any fall football tailgate gathering perfect. 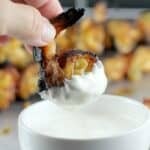 I am working with several brands here for this Bacon-Wrapped BBQ Stuffed Shrimp post (FUN right?) 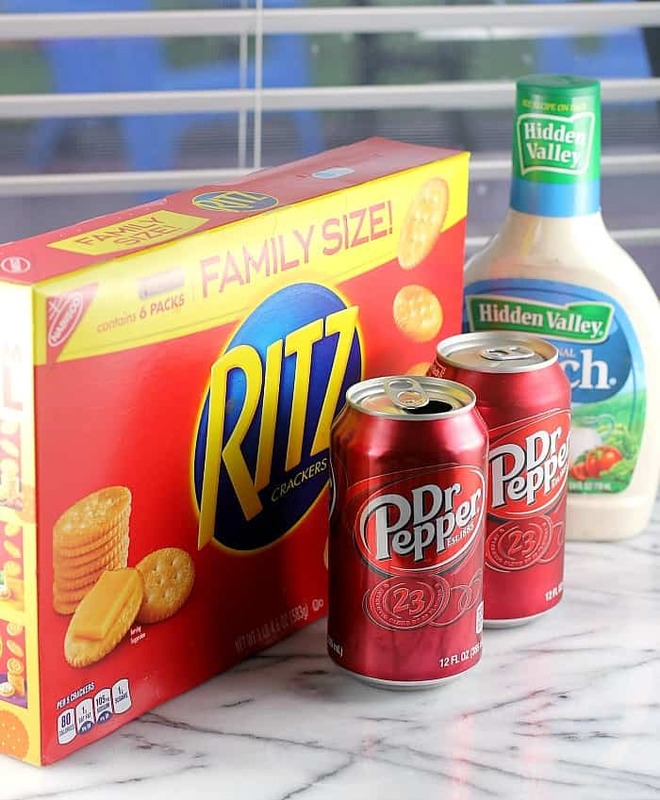 – Dr Pepper, RITZ crackers, Kingsford® Charcoal, and Hidden Valley® Ranch. Whew. How proud am I that I knocked out a recipe using them ALL? But it was actually easy, because they are so fun for a foodie to play with. I have worked with RITZ before by the way, and my Garlic Sriracha Shrimp Topped Crackers are still to this day a family favorite party bite. My teenager still requests them when she has a sleepover party. Weird? Probably. 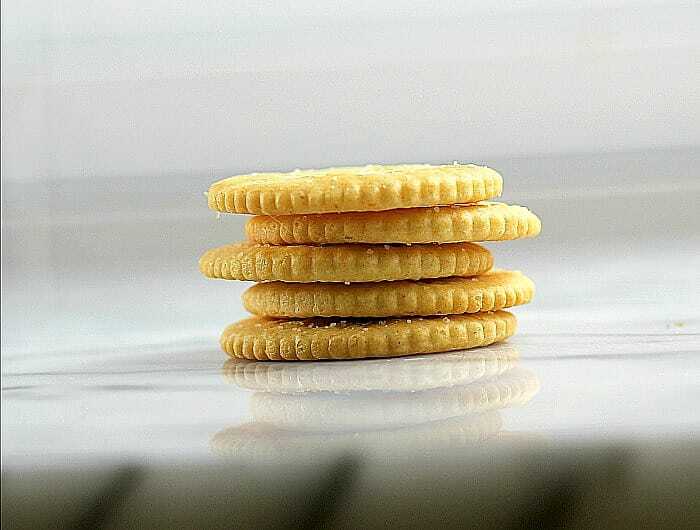 RITZ crackers are the quintessential ingredient for a good seafood stuffing. I remember eating stuffed lobster in New Hampshire when I was in college and pretty much the stuffing was all RITZ crackers and butter. So, accordingly, I have that affection. Likewise, Dr Pepper soda is fantastic as part of the base for a BBQ sauce – just look at the caramelization on my shrimps. 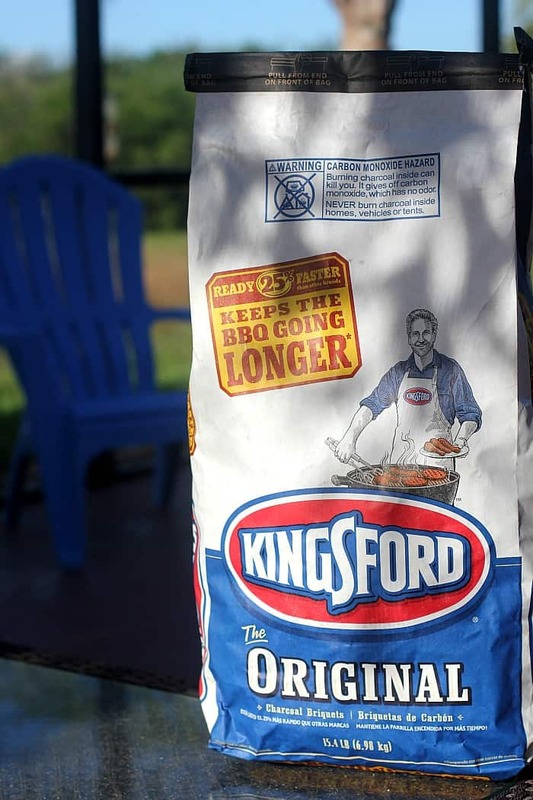 And while we’re at it, if you are going to grill ….clearly, Kingsford. Nothing beats that charcoal grill flavor. 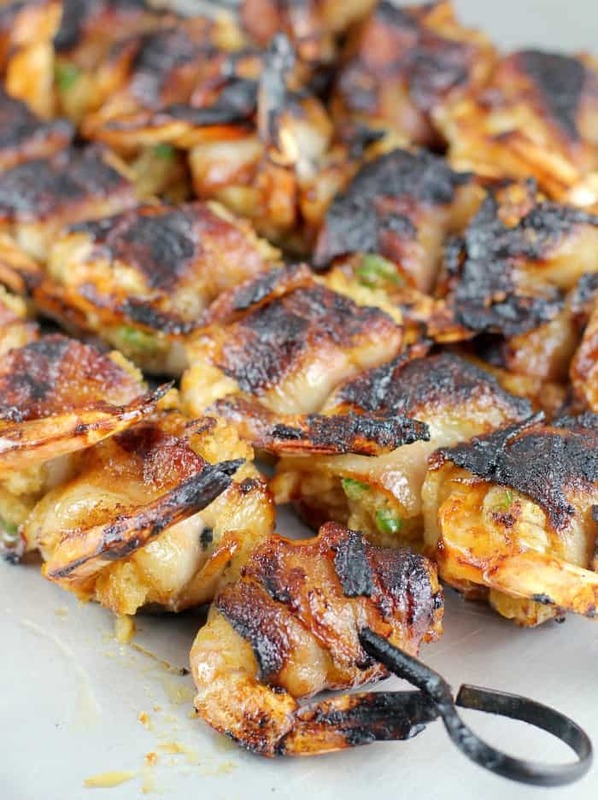 So, this Bacon-Wrapped BBQ Stuffed Shrimp recipe. First, we make a BBQ sauce. This is very easy, we just saute up some onion and garlic, then add the rest and blend. Too easy. Next, we make the stuffing. Also easy – I just took a couple sleeves of RITZ crackers and applied force to the ends to crush them all, then emptied the sleeves into my bowl, added the rest and combined. Also, very easy. 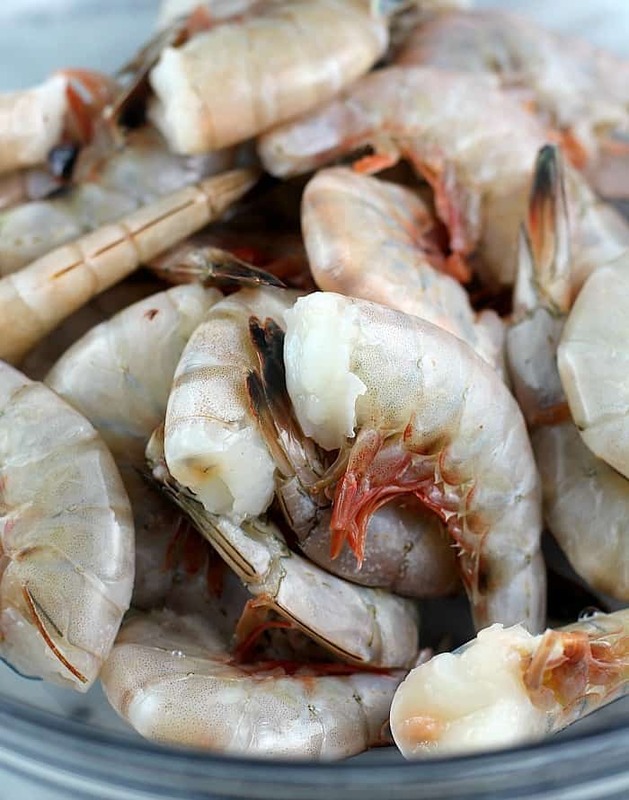 Clean up the shrimp, assemble, then grill. See? It is easy, and that is why I included so many photos in this post .. to take out the guesswork. Once they come off the grill, you are going to want to eat them right away but give them a minute – that filling is HOT. I totally scorched my mouth. Also, serving with the cool Hidden Valley Ranch helped for that and was a perfect finishing touch. So that’s it folks! I am super proud of this recipe, it is DELICIOUS. So when you head out for those football pre-game-shenanigans, pack this recipe up along for the ride. Huge shrimp stuffed with a classic RITZ cracker seafood stuffing, wrapped in bacon, doused in a new Chipotle Dr Pepper® BBQ sauce, and grilled over coals for an epic bite that will win all the parties. To make the Chipotle Dr Pepper BBQ Sauce, heat the butter in a medium saucepan. Add the onion and garlic and cook until onion is translucent. Add the remaining ingredients. Hit the mixture with an immersion blender (see Notes) until smooth. Simmer the BBQ sauce over medium-low heat for a while (~45 minutes) until thickened and flavors are blended. To prepare the Seafood Stuffing, add the stuffing ingredients to a large bowl. Combine with a fork. To assemble, lay out the half-cut strips of bacon. Place a butterflied shrimp on each, tails in the air. 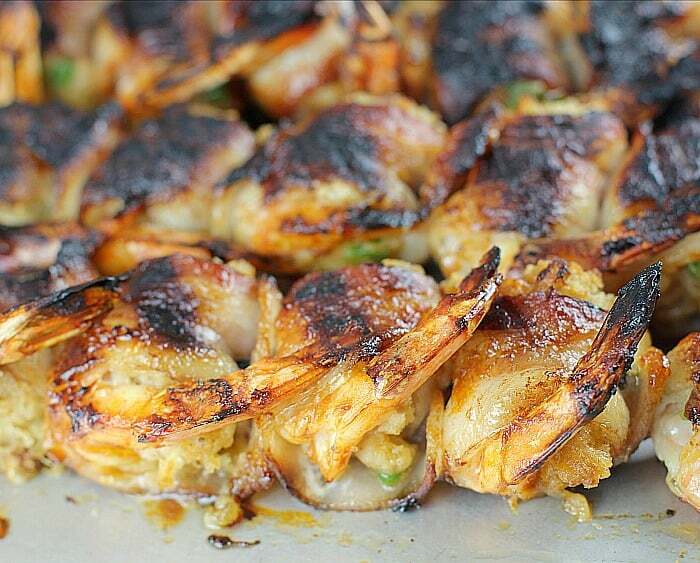 Place ~ a tablespoon of stuffing on each shrimp. Fold up the bacon to wrap the shrimp and stuffing. Skewer, ensuring that the skewer passes through both ends of the bacon to keep it wrapped while cooking. Place Kingsford briquets in your grill in a tight pile (or use a chimney if available), add a little lighter fluid, and light. Let the briquettes burn to almost all white ash, then spread them out into a single layer. Place the grill grate over the coals to heat. Grill the shrimp skewers, covered (turning once and brushing with more BBQ sauce), until bacon is cooked (~15-20 minutes total). Remove skewers from the grill. Serve with Hidden Valley Ranch Dressing for dipping. Alternatively, a regular blender can be used in place of an immersion blender. But if using a regular blender, add all ingredients EXCEPT the Dr Pepper. Blend and transfer back to the saucepan, THEN add the Dr Pepper. This will cut down on the volume of liquid in the blender and make it easier. The Seafood Stuffing and the Chipotle Dr Pepper BBQ Sauce can be prepared a day in advance. 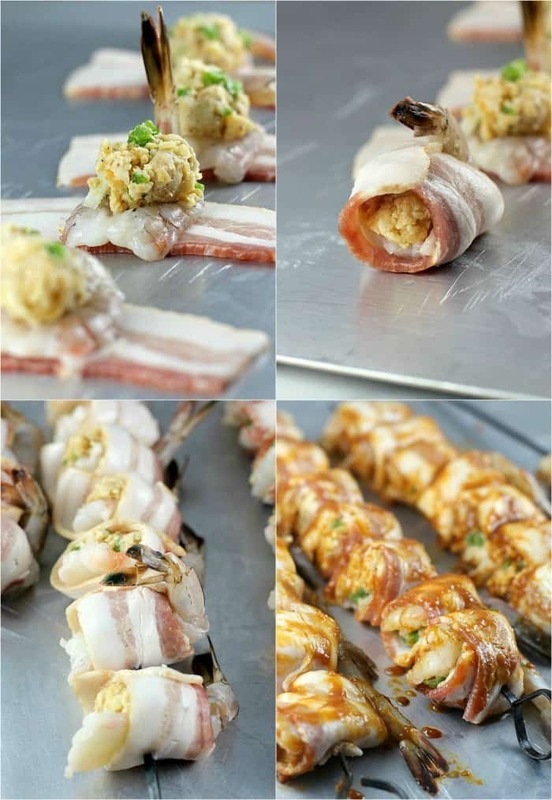 The bacon-wrapped stuffed shrimp can also be assembled a day in advance. Wait on brushing with BBQ sauce until ready to cook, as the acidity in the sauce would "ceviche" cook the shrimp. Visit the grillgating site for more ideas HERE. And leave me a comment! What do you grill up when you tailgate? What a fabulous recipe, and I’m so impressed that you made a recipe using all these great brands! Of course, like you said, as a foodie that’s fun! This will be great at my tailgating parties. My mouth is watering over these. holy moly do they look amazing, and that sauce! Yum! There’s a party going on with that shrimp! 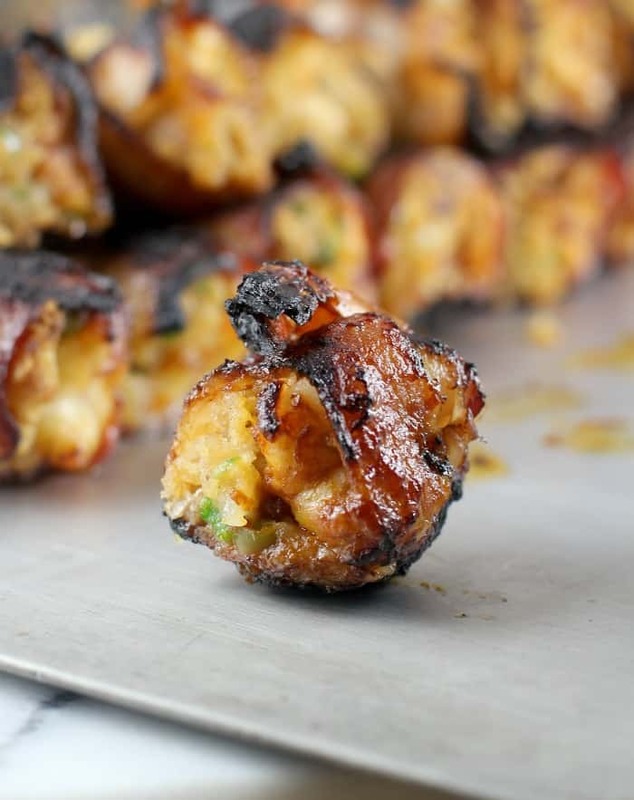 Love the bacon, love the stuffing – everything I need for great finger food, YUM! Oh yes, yes, this is definitely a recipe I’d love. 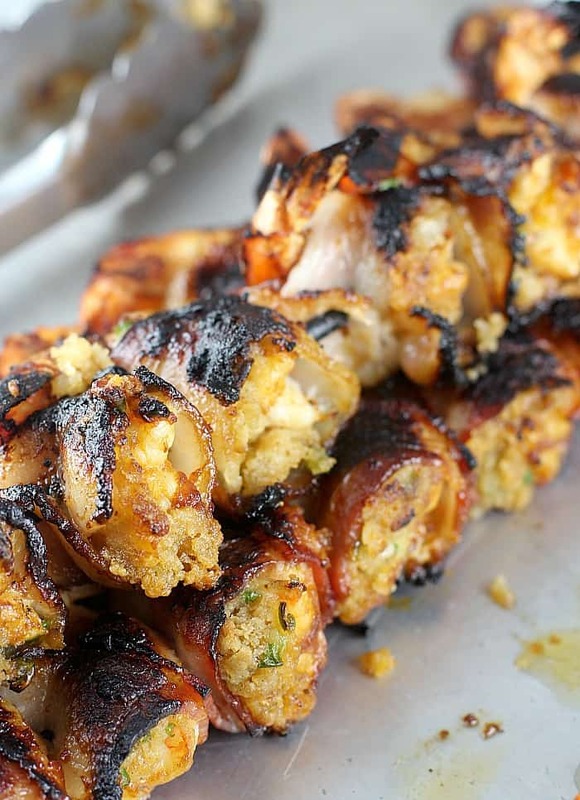 I love bacon and shrimp, I love the charring of cooking on the BBQ, and the stuffing sounds so good too! My mouth was watering as I read the post! The pictures made me even more hungry! I think this recipe is a must try. It looks really tasty! This recipe is so creative and full of good ingredients and layers of flavors I wish I could sample now! I make bacon wrapped chicken with a cheese stuffing, so obviously I gravitate towards liking your bacon wrapped shrimp. Also the fact that that you douse your bacon wrapped shrimp in chipotle makes it even more appealing to me since love chipotle salad dressing and so I buy it every week. As you said this hors d’oeuvres is good for game- time with friends and fellow sports enthusiasts. 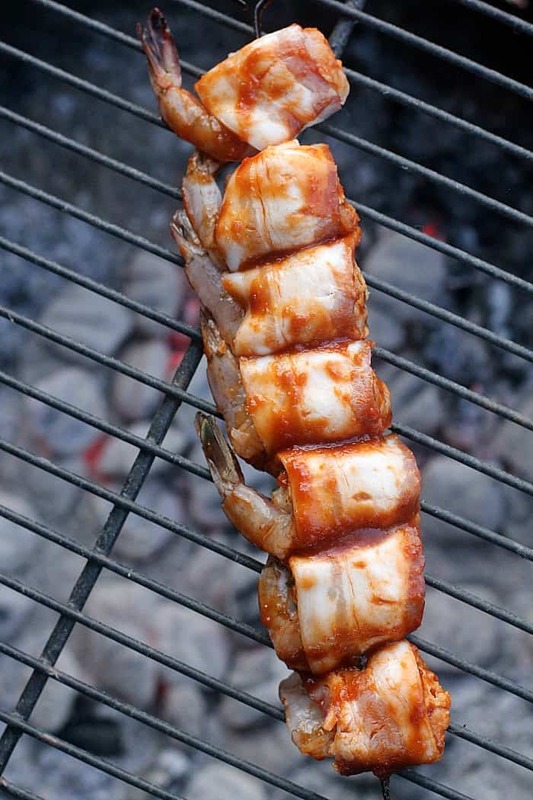 This bacon wrapped BBQ shrimp looks so tempting and mouth watering. I will definitely shared this recipe to my friends. Over 20+ Ideas for EASY BBQ recipes!! !